Coordonnateurs : Monnerie Lucien, Suter U.W. With contributions by: R.H. Boyd; B.G. Sumpter, D.W. Noid, G.L. Liang, B. Wunderlich; M.D. Ediger, D.B. Adolf; R.-J. Roe; I. Bahar, B. Erman, L. Monnerie; A.A. Gusev, F. Müller-Plathe, W.F. van Gunsteren, U.W. Suter; L.R. Dodd, D.N. Theodorou; E. Leontidis, J.J. de Pablo, M. Laso, U.W. Suter; K.S. Schweizer. 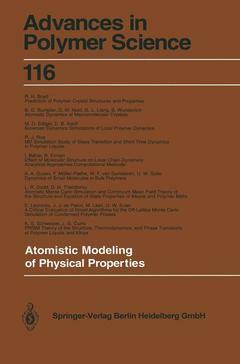 Prediction of polymer crystal structures and properties.- Atomistic dynamics of macromolecular crystals.- Brownian dynamics simulations of local polymer dynamics.- MD simulation study of glass transition and short time dynamics in polymer liquids.- Effect of molecular structure on local chain dynamics: Analytical approaches and computational methods.- Dynamics of small molecules in bulk polymers.- Atomistic Monte Carlo simulation and continuum mean field theory of the structure and equation of state properties of alkane and polymer melts.- A critical evaluation of novel algorithms for the off-lattice Monte Carlo simulation of condensed polymer phases.- PRISM theory of the structure, thermodynamics, and phase transitions of polymer liquids and alloys.